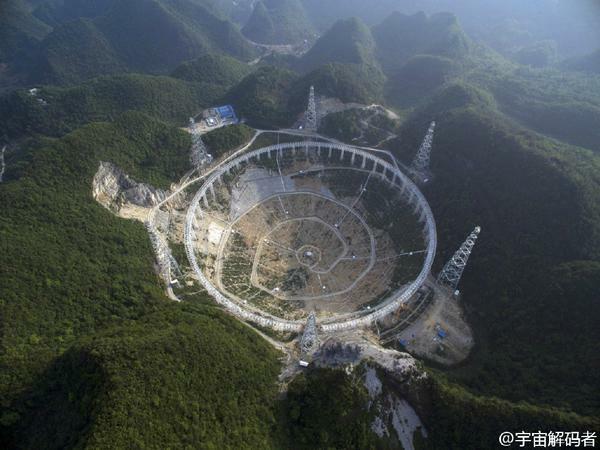 China is assembling the world's largest radio telescope. 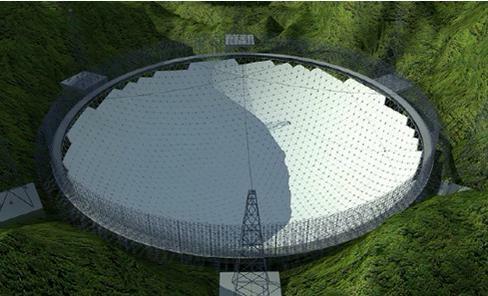 The 500-meter tool will hold a dish the size of 30 football pitches, surpassing Puerto Rico's Arecibo Observatory, “only” 305 meters in diameter. With a boundary of about 1.6km, it will take up to 40 minutes to walk around the single-aperture sphere-shaped telescope, which is named "FAST". It will be assembled deep in the mountains of the southwestern Guizhou Province, constructed on a naturally made bowl-shaped valley, Xinhua reports. Sun Caihong, chief engineer of FAST's construction, told the news agency "There are three hills about 500 meters away from one another, creating a valley that is perfect to support the telescope,"
The assembling of the highly sensitive telescope started in March 2011 and is due to be finished next year. On Thursday, engineers already started attaching 4,450 triangular-shaped panels to the telescope's reflector. To overlook the entire reflector, people will seemingly have to climb up to the top of one of the hills. An observation platform is presently said to be under construction. The chief researcher of the FAST project, a Chinese astronomer Nan Rendong, said that the larger the dish is, the more powerful the telescope. Nan Rendong said "A radio telescope is like a sensitive ear, listening to dustinguish meaningful radio messages from white noise in the universe. It is like identifying the sound of cicadas in a thunderstorm,"
The so-called Karst topography in the adjacent landscape is perfect for draining rainwater underground and shielding the reflector, according to Chinese scientists, adding that the adjacent area is considered as a positive "radio silence." The dish will move to get radio signals from different angles. Zheng Yuanpeng, chief engineer of the telescope's panel task, told Xinhua "Panels can change their positions through connected wires and parallel robots. We can control their position with an accuracy of 1 mm,"
It's expected that this new telescope will increase Chinese scientists' capacity to observe outer space. Wu Xiangping, director-general of the Chinese Astronomical Society, said "Having a more sensitive telescope, we can receive weaker and more distant radio messages. It will help us to search for intelligent life outside the galaxy and explore the origins of the universe,"